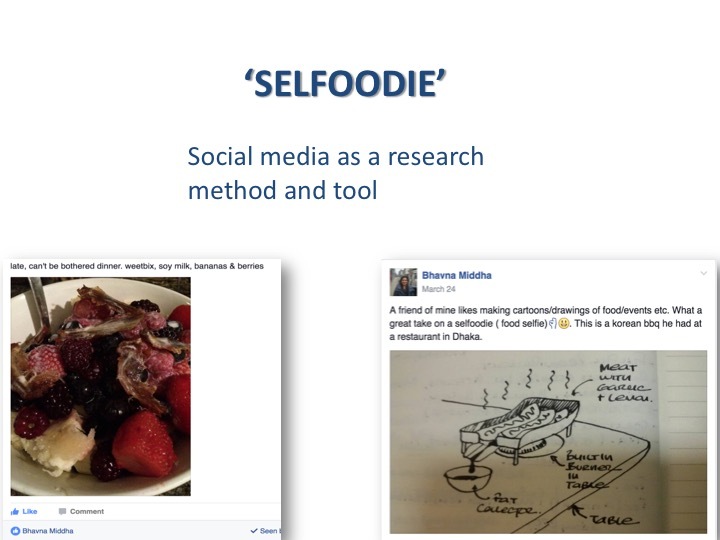 ‘Selfoodie’(posting food selfies) is a research method I have used to follow the students’ eating practices on and off campus and as a way of exploring the changing spatio-temporal characteristics of eating practices. 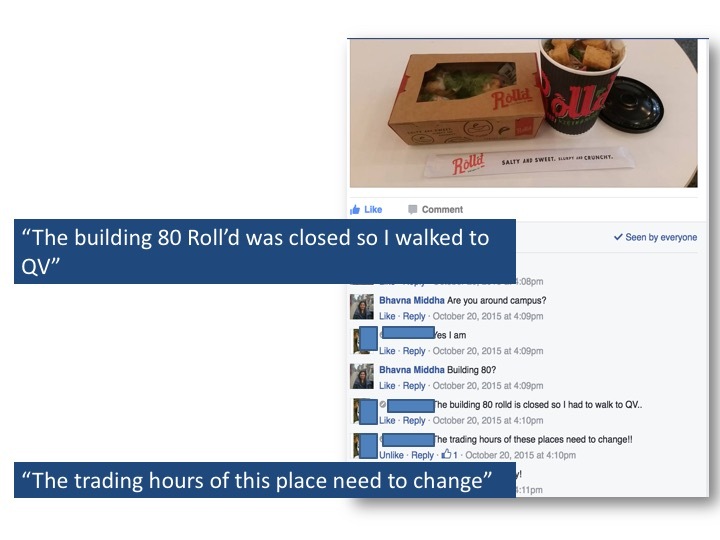 In my project research participants provided literal snapshots of their eating practices, on a private Facebook page, as they moved through their day and shuttled between home, university and on and off campus eating spaces. In recent years, there has been a huge rise in the use of social networking sites like Facebook and popular modes of picture taking, such as the personal and food ‘selfie’, and subsequent interest from the research community in investigating these (Borgerson & Miller 2016; Gómez & Thornham 2015). Recent research into social media advocates for going beyond looking at selfies as representations and seeing them as a part of “a wider social, cultural, and media phenomenon” (Gómez & Thornham 2015, p. 1). The following slides illustrate how digital and social media can capture social practices in motion. I also propose that there are distinct advantages to these methods, such as reducing the space and time constraints involved in following people. The paper thus concludes that using food selfies, a popular practice itself, has offered a way of capturing the spatio-temporal mobility of practices. 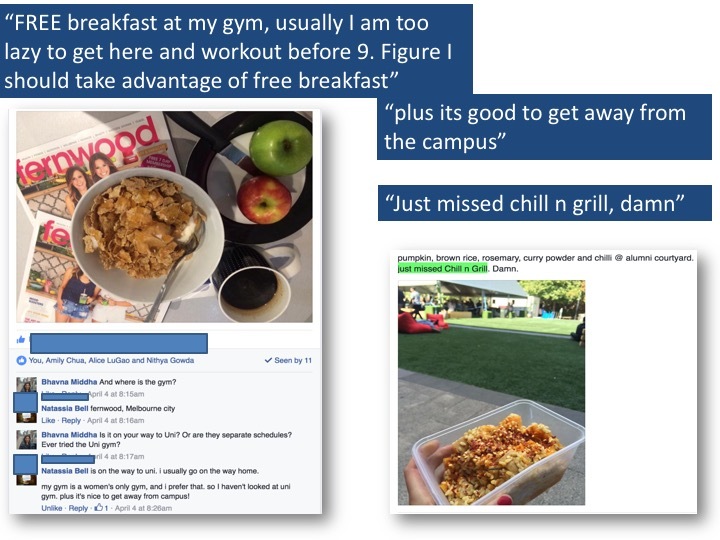 As the picture shows, for Nancy, routines are set by her cooking at home in bulk but are then disrupted by free meals either at the gym or at the University. The images and posts show that this spatio-temporal scripting of food provisioning at the campus is challenged by peak hours such as exam times and the kind of restaurants available or open at that time. 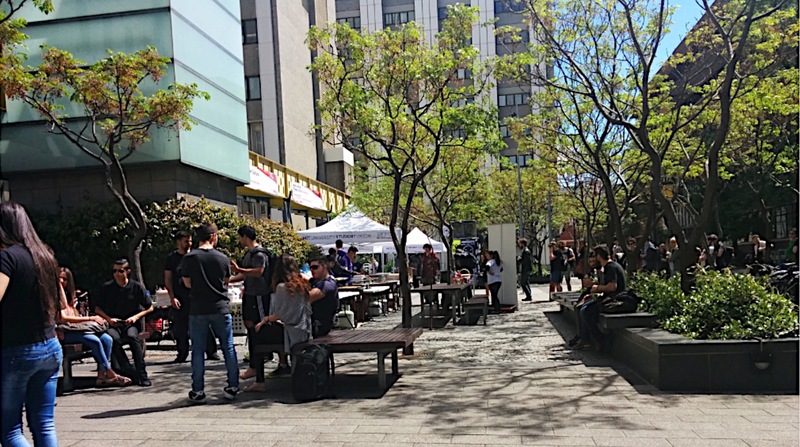 The fact that students want to stay away from the campus suggests that the food retail strategies of keeping students on campus for retail outlets and campus experience may be more of a social experience than being food related. While the trading hours at the University are centered around how much business can be made. The city comes in handy in such cases where the campus arrangements do not match the requirements of the students. While for others exam times make meal times an unnecessary burden, again highlighting how eating practices are contingent upon non food-related activities such as exams and class timings. In the case of Alice routines such as frequent visits to Chinatown only became obvious when pointed out during a conversation, emphasising the importance of such methods in differentiating between doings and sayings. This highlights the importance of finally the methods of institutional research such as surveys and feedback forms that may miss out on how the actual day-to-day eating practices of students challenge the spatio-temporal scripting in strategies and spaces of food provisioning and consumption on campus.